Last weekend I planned a surprise birthday party for my boyfriend and surprised him with dinner and an evening on the rooftop with our friends at STIRR in Deep Ellum! He was shocked and had no idea it was coming, even though he almost ruined my plans a few times during the week leading up to the party! 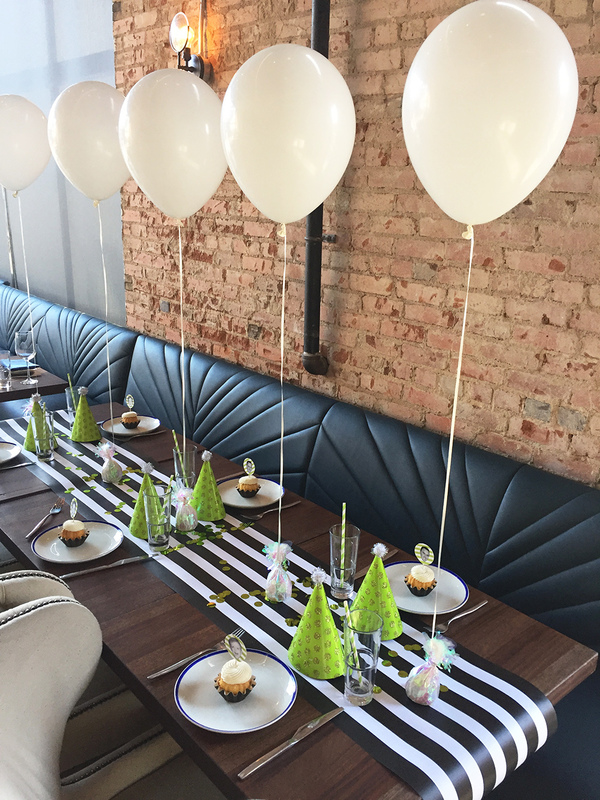 I'm going to share the party details with you and how to execute a few special touches that will put your party over the top! 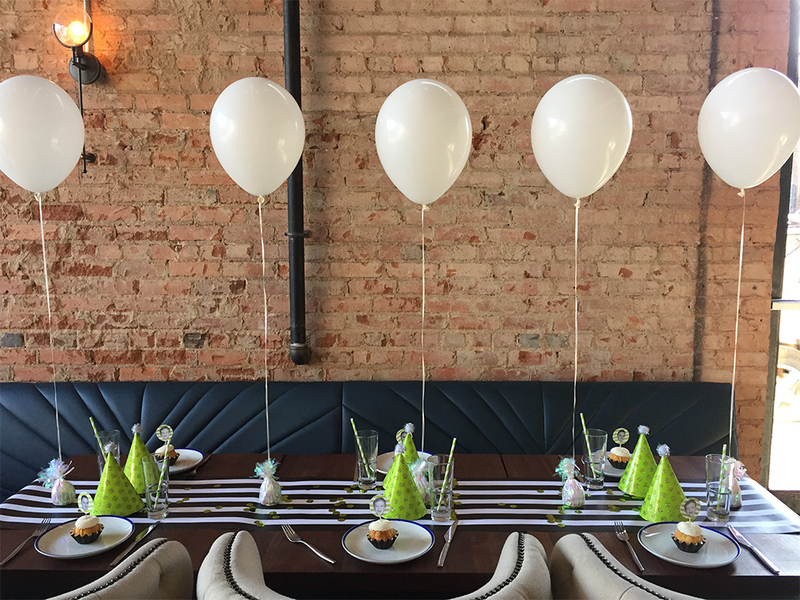 You probably know that location is one of the most important aspects of any event and that is also true for a surprise party. My boyfriend, Stephen loves to try new restaurants and especially loves places with rooftop views of downtown Dallas. 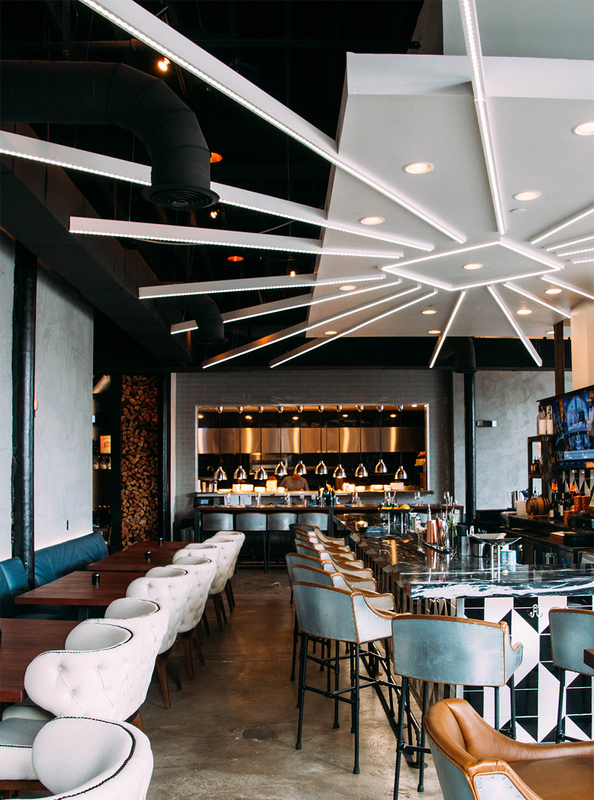 After a little location research, I decided on hosting his party at STIRR- a relatively new upscale American restaurant in Deep Ellum, where we could have dinner then invite 50+ friends up to the rooftop. I knew that he would love it! Well, he almost ruined my plans when two days before his party, he surprised me with reservations at a "cool new restaurant in Deep Ellum." Yes...at STIRR!! I panicked and floundered around when he told me in the car where we were going. (Should I say that I don't want to go? That I've been there before? Ugh.) I couldn't think of anything so I just said "..........ohhhhh.... cool...." Very smooth, really. Let's backtrack. I had been planning his surprise party for a month or so and finally decided on a plan that involved dinner followed by a huge group of friends joining us on the roof. My original plan involved two surprises- a surprise within a surprise actually. Stephen was getting concerned that I hadn't made any plans for his birthday- I'm an event planner after all, so I also told him (lies) that we would do a big birthday brunch for him on Sunday morning since we weren't celebrating with a big group. I told Stephen (more lies) that Saturday night we were going to dinner just the two of us, then had 5 friends surprise him and join us for dinner so that he would think dinner was the only surprise. Then the plan was to go up to the rooftop after dinner where the large group would be waiting for him! One very important part of a surprise party is having accomplices; you can't do everything yourself! Make sure you have a few key people in the know to help you cover your story and to guide the group waiting for guest of honor to arrive. After Stephen took me to STIRR on Thursday night, I panicked and changed our dinner reservation to another restaurant in Deep Ellum, which I shouldn't have, but oh well. Stephen fell into my trap and thought that dinner was the surprise, so during dinner I casually mentioned "hey guys...Stephen took me to this cool placed called STIRR and if y'all are up for it after dinner we could go check out the rooftop!" Everyone was in on the plan, so they all agreed that it sounded fun. Stephen somehow thinks that this part was his idea, so we will just let him continue to think that. We walked over to STIRR and went upstairs to the roof which was packed; we made our way to our reserved tables in the corner where our group was ducked down, then they jumped out and yelled SURPRISE and started singing happy birthday to Stephen! He was SO excited to see all of his friends and he was greeted with a red velvet bundtini (his favorite!) from Nothing Bundt Cakes and was on cloud 9. We talked with friends and danced along with the rooftop DJ for the rest of the night and it was the perfect surprise. I couldn't decide on a theme for the party, so I plastered the honoree's face on everything! His mom had coincidentally sent me a childhood photo a few months prior and I knew I would be able to use that for the party. 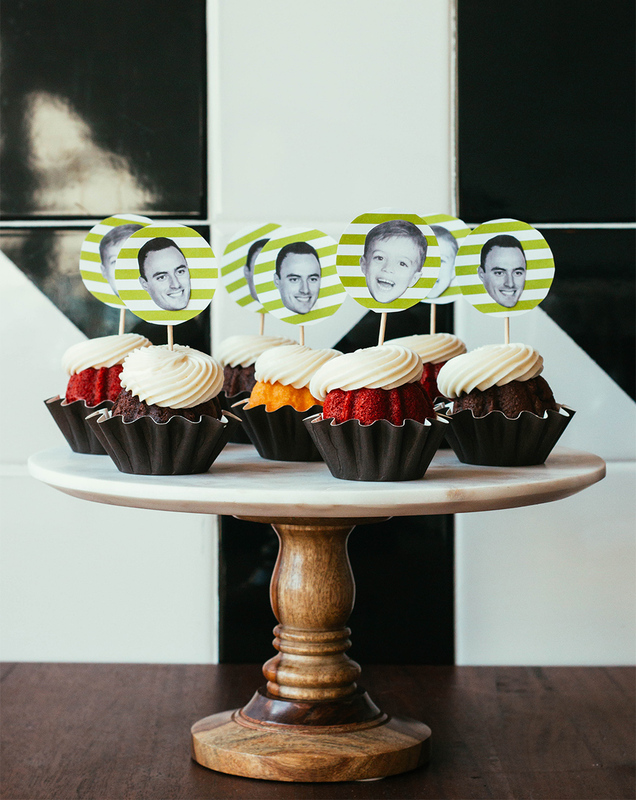 I used that along with a current photo to craft custom cupcake toppers as well as stickers for all of the guests to wear that I'll be sharing later this week for all of you DIYers. Be sure to make and communicate a party timeline with your accomplices and be sure to give yourself some cushion. Dinner ended up taking longer than expected so we ended up using our "extra" time. I couldn't have executed this party without a ton of help- thank you to all of the friends who helped make this a special night! Special thanks to STIRR and Nothing Bundt Cakes for helping make this event one to remember! Photos by Christian Short for The Skinny Arm.